Amesha Spenta, literally meaning "Bounteous Immortal," is an Avestan term for a class of six divinities in Zoroastrianism, which are identified as: Vohu Manah (Good Mind), Asha Vahistah (Truth), Khshatra Vairya (Good Dominion), Spenta Armaiti (Devotion), Haurvatat (Wholeness and Health), and Ameretat (Immortality). Each of these beings is considered to be worthy of worship in its own right, although not in a direct fashion. Instead, cultivation of the qualities they represent serves as a means for communicating with the supreme divinity Ahura Mazda. Although the identification of these beings seems to suggest the existence multiple deities, as in polytheism, the Amesha Spentas are considered to be emanations of Ahura Mazda, which personify the abstract qualities Mazda embodies rather than distinct divine beings. The term Amesha Spenta itself does not appear in the Gathas, the most sacred texts of Zoroastrianism, which have been dated around 1000 B.C.E. However, the word Spenta does appear in this text, referring to the process of "furthering" or "strengthening," as well as the qualities of "wholeness" or "holiness." Despite the fact this specific term does not appear in the Gathas, a group of entities surrounding Ahura Mazda do figure significantly in the text. Ahura Mazda is referred to as the father of the Holy Spirit (Spenta Mainyu), as well as Truth, the Good Mind, and Righteousness, all of which would become personified as Amesha Spenta within later Zoroastrianism. Additionally, Ahura Mazda is called a "Father" in that he created these three abstract concepts by an act of his own will (khratu). Individual Amesha Spentas are also occasionally named in the Gathas. Soon after Zoroaster's death, the entities that were related to Ahura Mazda were drawn into a heptad, which included the Amesha Spentas and Spenta Mainyu, the Holy Spirit. Ahura Mazda was identified as hypostatically linked with Spenta Mainyu, and placed within proximity to him were six abstractions Zoroaster wrote about so frequently: Good Mind, Truth, Right-mindedness, the Kingdom, Wholeness, and Immortality. Spenta, however, was not formally affixed with the adjective amesha ("immortal") to refer to these personified abstractions until the Avesta, the primary collection of Zoroastrian sacred texts, which was compiled as late as the second century C.E. In general usage, the term Amesha Spenta denotes all bounteous and holy divinities that furthered or strengthened creation. In this sense, Amesha Spenta may therefore be considered equivalent to the term Yazata, referring to any spirit worthy of worship. This meaning is particularly present in post-Sassanid era texts, although there are also instances in the Avesta proper where it is used in such a way. In Yasna 1.2 for instance, the Yazata Atar is declared to be "the most active of the Amesha Spenta." Even in modern Zoroastrianism, the term is frequently used to refer to the thirty-three divinities that either have a calendarial dedication or have a Yasht dedicated to them. The more specific (and more common) understanding of Amesha Spenta refers to the great six "divine sparks" of Ahura Mazda. In Zoroastrianism, these "divine sparks" refer to the first six emanations of the uncreated Creator, through whom all subsequent creation was accomplished. This fundamental doctrine is only briefly touched upon in the Gathas. In Yasna 47.1 of the Gathas, the six most important Amesha Spentas are listed as follows: Vohu Manah (Good Mind), Asha Vahistah (Truth), Khshatra Vairya (Good Dominion), Spenta Armaiti (Devotion), Haurvatat (Wholeness and Health), and Ameretat (Immortality). Each entity's powers exist as a function of Ahura Mazda's divine will, personifying attributes of his character and manifesting them within the physical world. The specific attributes represented by each Amesha Spenta are those that all mortals should strive to possess in order to cultivate asha ("truth"), thereby becoming ashavans or "possessors of truth." Thus, the doctrine of the divine heptad suggests that through good thoughts, words, and deeds, each individual should endeavor to assimilate the qualities of the Amesha Spenta into his or herself. The nature of the relationship between Ahura Mazda and the Amesha Spenta is at best an ambiguous one. In Yasna 31.11 of the Gathas, Ahura Mazda is said to have created the universe with his "thought." In other passages such as Yasna 45.4, Ahura Mazda is described as the metaphorical "father" of the individual Amesha Spenta, which, even though figurative, suggests a familial closeness between the various entities. As polytheism began to influence later Zoroastrianism, however, the Amesha Spentas grew more and more distinct from Ahura Mazda. Eventually, each Amesha Spenta came to maintain his or her own individual persona. However, it is likely that at the beginning of Zoroastrianism, these emanations were considered to be divine even though they were ultimately subordinate to Ahura Mazda, who dwelt within each of these deities, since they were part of his creation. Zoroaster prescribed strict monotheism as a response to the polytheism that was prevalent in Persia during his lifetime, therefore he did not conceive the Amesha Spentas as having an existence separate from Ahura Mazda. This focus upon Ahura Mazda's essential unity is evident in the way that Zoroaster typically conceived of Ahura Mazda as the supreme agent, carrying out his divine operations through individual Amesha Spentas. Thus, an unqualified referral to the "Amesha Spenta" is usually understood to include only the members of the divine heptad. In Yasna 44.7, 31.3, and 51.7, Ahura Mazda's Spenta Mainyu is the instrument or "active principle" setting in motion the act of creation. It is also through this "Bounteous Force," "Creative Emanation," or "Holy Spirit" that Ahura Mazda is immanent in humankind, interacting in the world (Yasna 33.6; 43.6), and how the Creator interacts with the world. Nevertheless, a later eleventh or twelfth century Persian text, the Bundahishn (3.12), recounts the Zoroastrian view of creation where the Amesha Spenta is extended to include Ahura Mazda, together with (or represented by) Spenta Mainyu. Through the centuries, each member of the divine heptad accumulated its own highly particularized character traits, which are discussed below. Each Amesha Spenta was also linked with a specific physical element and special domain. A veneration for the "divine sparks" through the living world is still present in modern Zoroastrian tradition, and is evident in every religious ceremony, where each of the Amesha Spentas is visibly represented by the physical element which they protect. In addition, the first seven days of the month of the Zoroastrian calendar are dedicated to the great Heptad and to creation, acknowledging the preeminence of the Amesha Spentas and Spenta Mainyu, and so ensuring the inculcation of their doctrine. The individual Amesha Spentas are typically represented in iconography as human beings dressed in traditional Zoroastrian attire of cloak and cap. They are often accompanied by the physical element with which they are related. While Vohu Manah, Asha, and Kshathra are consistently of neuter gender in Avestan grammar, they are traditionally considered masculine. Armaiti, Haurvatat, and Ameretat are invariably feminine. Asha Vahista (or Ardavisht) is the most frequently mentioned Amesha Spenta in the Gathas, although Zoroaster may have been referring to the principle exemplified by Asha Vahista rather than the entity himself. Asha Vahista represents asha, the cosmic principle of truth and order by which Zorostrian followers live, striving to become ashavans. Asha is considered the quality of the divine that most effectively opposes drug, or the "lie," which is utilized by evil spirits; as such, Asha Vahista is closely associated with truth and righteousness. Asha Vahista is commonly related to luminaries, particularly fire. In the Yasna, for instance, he is realized by fire, which illustrates his immense importance, since fire is considered by Zoroastrians to be the most important of the physical elements and serves as the focal point of the Yasna ritual. Vohu Manah (or Vahman) represents Good Mind or Vision, and is mentioned in the Gathas almost as frequently as Asha Vahishta, a testament to the mutual importance of both entities. The two appear together as members of a Gathic trinity, of sorts, along with Ahura Mazda. Vohu Mana denotes the intellectual gifts of clear perception and discernment which Ahura Mazda bestows upon those who live in accordance with his truth. Because of Vohu Manah, Zoroastrian adherents (including Zoroaster) are rendered with the ability to recognize Ahura Mazda's holiness. Ahura Mazda imparts his wisdom through Vohu Manu by either choosing to endow an individual with knowledge or specific aptitudes, or to augment the insight or virtue an individual has already accumulated through their own personal efforts. In the physical world, Vohu Manah is related to all of animal creation, particularly cattle, of which he serves as the protector. In the Yasna, Vohu Manah was at one point represented by a sacrificed animal. Although real animals are no longer used in this ritual today, Vohu Manah is now represented by dairy products such as milk and butter, as well as a sieve which is made from the hair of a consecrated bull. Kshathra Vairya (or Shahrevar) represents the Good Dominion of Ahura Mazda, embodying the ideals of social order and proper kingship. Kshathra Vairya serves as a reminder to the ashavan of the importance of authority within the temporal sphere, an authority which must be present in every level of society, from the head of the family to the ruler of the kingdom. In the Gathas, Kshathra does not have an association with a specific element of creation, and it is not until the later texts that he is considered the guardian of metals and the sky. Modern scholars explain this somewhat anomalous pairing of sky and metal by examining the development of cosmogony throughout the epochs. In Stone Age cosmogony, the sky is listed as the first of the creations (and is thought to be made of stone), but metal has no place among the creations. This is also reflected in Zoroaster's revelation, where he claims the sky is "of the hardest stone" (Yasna 30.5). As such, Kshathra came to be connected with stone. Later, with the introduction of bronze and then iron tools, the sky came to be seen as being made of crystal, and was therefore considered to be both stone and metal (Yasht 13.2). In due course, Kshathra's association with a stony firmament was eclipsed by his association with a metallic sky. Afterward, he came to be associated with metals in general. This is reflected in the Yasna, where Kshathra Vairya is symbolized by metal implements which are used by the officiating priest and his helper. Spenta Armaiti (or Spendarmad) is the aspect of Ahura Mazda that represents dedication and piety. She has been entrusted with the care of earth, thus, religious devotion of Zoroastrians is deeply connected to the creation which she represents. Because of this connection, Spenta Armaiti is represented in the Yasna ceremony by the consecrated ground of the ritual area, or the pawi. 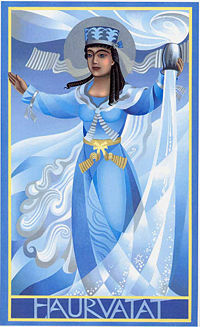 During the Yasna ritual, she is recognized for her protective watch over not only the pawi, but also the entire earth. She symbolizes the link between that which is consecrated and that which is not, since by virtue of her omnipresence she transcends the limits created by the division between the sacred area and the world outside it. Haurvatat (or Hordad) embodies plenitude and perfection. She has responsibility over water, which speaks to her crucial role in maintaining a healthy life. She is represented by water in the Yasna ceremony. At one point in this ceremony, consecrated water is mixed with pomegranates, goat's milk, and twigs. This mixture is then poured into a special well outside the pawi so that it may render its strengthening abilities upon all of creation. As such, the ritual uses water to draw upon Haurvatat's wholeness and integrity, in that she is able to so effortlessly touch all of creation with her benevolence. Ameretat (or Amurdad) personifies long life, which eventually becomes immortality for the ashavan. Fittingly, she is represented in the Yasna ceremony by the preparation of the Haoma, a beverage which is thought to bestow temporary immortality upon the individual who consumes it. Ameretat is responsible for the protection of plants, which aid in the preservation of life. Ameretat is commonly grouped together with Haurvatat, due mainly to their complementary healing and life-giving properties. Together, they are identified by Zoroaster as a source of nourishment which sustains Ahura Mazda himself. These two Amesha Spentas also represent the spiritual entities in the least proximity to Ahura Mazda. This does not suggest their inferiority, however, but rather occurs as a consequence of the fact that they are realized in full only after death and the judgment which follows. Most scholars believe that the Amesha Spentas are actually reconceptualizations of Vedic deities. For example, the term "Kshatra" is closely related to the Sanskrit term "Kshatriya" (warrior/official). Zoroaster superimposed the institution of the warrior atop his ethical model, suggesting that each human being had to do battle against the forces of evil in their own lives if they sought to realize Good Dominion. Kshathra Vairya is also responsible for the protection of the sky, the jurisdiction which Indra came to rule over in the Vedas. Thus, this Zoroastrian divinity may have been a refashioned continuation of the Vedic God Indra. Like Indra, Kshatra embodies good dominion. Even though Indra's militaristic nature precisely embodied the religious elements that Zoroaster was attempting to eschew in the formation of his new faith, Indra also represented ideals of social order and proprietous kingship, which appealed to Zoroaster. Furthermore, Asha Vahista seems to be related to the Vedic god, Varuna. Just as Varuna upheld rta, the cosmic order of morality and truth, Asha Vahista protects asha, a virtually identical cosmic principle. Thus, Zarathustra's identification of individual Amesha Spentas with an abstract concept follows a precedent in Indo-European religion to correspond various abstractions with particular divinities. The doctrine of the 'divine sparks', through their connection with creation, unites ethereal and spiritual concepts with material and manifest objects not only as abstract "aspects" of Ahura Mazda, but as entities also worthy of reverence themselves. However, the reverence of the Amesha Spentas has been frequently attacked as de-facto polytheism, not only in modern times, but in the Sassanid era as well. A frequent target for both parties was the Zoroastrian credo in which the adherent declares: "I profess to be a worshiper of Mazda, follower of the teachings of Zoroaster, ... one who praises and reveres the Amesha Spenta." While the "worship of the elements" was a repeated accusation made against Zoroastrianism during the 4th and 5th centuries, Christian missionaries in 19th century India identified the belief that the Amesha Spenta were immanent in physical substances as indicative of the fact that Zoroastrians were polytheistic. Man prays to God through Christ just as God creates through the same Christ, his Son and the pre-existent word. So, too, in Zoroastrianism, it is through the Good Mind that God communes with man, and through the Holy Spirit that he creates, both the Good Mind and the Holy Spirit being his 'sons'. He also reigns in virture of the Kingdom which is his by right in union with the Holy Spirit, and his reign lasts for ever and ever because he is possessed of Wholeness and Immortality (47). In the second half of the 19th century, Martin Haug proposed an alternative explanation of the doctrine of Amesha Spentas. He claimed that Zoroaster himself had viewed the Amesha Spentas as philosophical abstractions, and that a personification of the Amesha Spentas and Spenta Mainyu was really just a latter-period corruption. Thus, Ahura Mazda was essentially one. The Parsis of Bombay (now known as 'Mumbai') gratefully accepted Haug's premise as a form of defence against the Christian missionaries, accusations of polytheism, and subsequently disseminated the idea as a Parsi interpretation, corroborating Haug's theory. This principle of "continuing monotheism" eventually became so popular that it is now almost universally accepted by Zoroastrians as doctrine. "Amesha Spentas." Encyclopedia of Religion, ed. Mercia Eliade. New York: MacMillan Publishing, 1987. 234. Boyce, Mary. "Aməša Spənta." Encyclopaedia Iranica. New York: Mazda Publishers, 2002. Boyce, Mary. "Ahura Mazda." Encyclopaedia Iranica. New York: Mazda Publishers, 2002. Colpe, C. "Reflections on the history of the Amesha-Spenta conception." Proceedings of the XXIX International Congress of Orientalists, 1975. Dhalla, Maneckji Nusservanji. History of Zoroastrianism. New York: OUP, 1938. Haug, Martin. Essays on the Sacred Language, Writings and Religion of the Parsis (3rd Edition). London: 1884. Kotwal, Firoze. The Supplementary Texts to the 'Shayest ne-Shayest. Bombay: 1969. Wilson, James. The Parsi religion: Unfolded, Refuted and Contrasted with Christianity. Bombay: 1843.